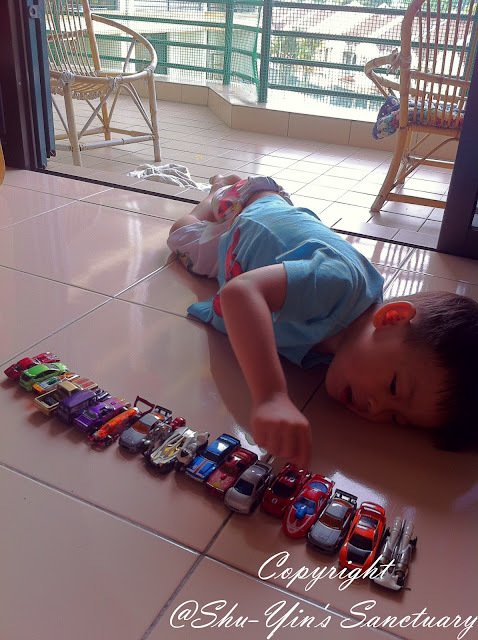 Since Shern was small, he would always play his toy cars, trains, etc with him lying on the floor, facing sideways with one cheek on the floor, and wheel his toy vehicles, just like this. Even now at almost 4 years old, he is still doing this. Look at the photo below taken beginning of this year, where Shern was playing with his Hot Wheels in that position. Since for quite some time, when Shern is in this position, he would closes his right eye and uses only his left eye to see while wheeling his toy vehicles. He has been doing that for as long as I could remember. Well, at least for the past 2 years. Although I didn't like him doing that, but as it was not giving him any problems (he can see well, not squinting), so I let him be. And he does just that only when playing with his toy vehicles, and not when he is sitting or standing up. But about 2 weeks ago, in the car, Pho-pho pointed to some words outside the window. And Shern squinted to see the words. And when I asked him why did he do that, he answered "So that I can see more clearly". His reply shocked the hell out of me! I was so afraid of him having eye problem, because for the first time, I see him squinting! 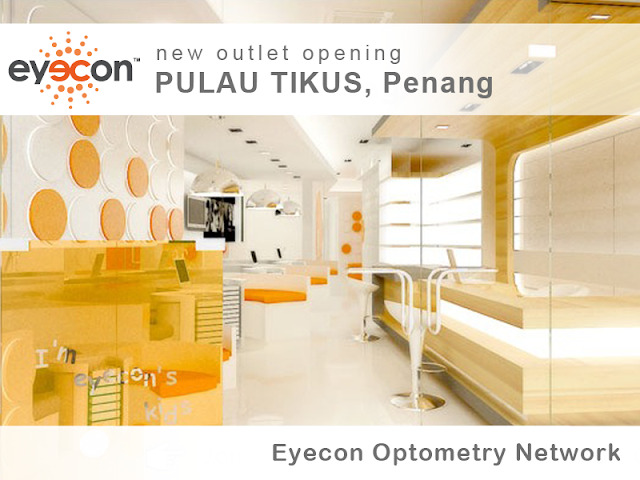 I quickly made an appointment with Eyecon to get his eyes checked. I chose Eyecon Optometry because they specializes in Child Optometry, which is very important to me because I want the optometrist to connect with Shern, so that Shern feels comfortable and that will give a more accurate diagnosis I think. The moment we reached there, there is a sign which says "No Shoes Allowed", as the place caters for even toddlers whom may crawl about everywhere. So baby friendly, which I like a lot. And while I register Shern, Shern wandered off with Pho-pho because he saw the small play area. Before going there, I already kinda prepped Shern that there will be a Miss Ho who is like a doctor, and she will be checking his eyes for him. Shern likes all his doctors so far, so he was really looking forward to this optometrist visit. Hehe. After I registered, Miss Ho herself came out and asked me some questions, to better understand my concern. After I told her about my concerns on Shern's long-term one-eye-shut while playing his toys on the floor, and his one-time squinting episode, Miss Ho went to prep the examination room. Miss Ho then came out to invite Shern into the room, holding Shern's hand while telling him that "we are going to play some games". That got Shern interested. 'Play' and 'Games' are definitely his few favourite words. At the examination room, Miss Ho took out a few shapes puzzles and asked Shern to do, while asking him to identify the shapes. Shern did pretty well on that, and Miss Ho had him do it a few times. Then later she took out the eye test chart, but instead of the normal eye test chart with alphabets, she took out an eye test chart with the shapes she asked Shern to identify just now. Oohh....so that was why Miss Ho got Shern to play with the shapes puzzles, so that she is sure he can identify them correctly. Really good. Then she got around doing more tests, while telling Shern they were playing games. She had him sitting on the 'Big Boy Chair', and wearing 'Pirate Glasses' and 'Magic Glasses', and even had animal puppers on her fingers while checking for eye balance and etc. And when she uses a device to estimate the power of his eyes, she suddenly whips out a tv with some nursery rhymes cartoons to distract Shern when she shone it in his eyes. And while doing that, Miss Ho was still asking Shern questions like 'what colour is the elephant on that tv?' and was even singing to the music together with Shern. Talk about clicking with kids! I was so impressed with her. And once Shern said they were "blur blur", and I was beside him thinking 'Oh no! ', but then Miss Ho quickly assured me, it is because she was using fogging lens. I was relieved. This is Miss Ho, trying to tell Shern to wear his 'Pirate Glasses' for short while, closing the vision one eye at a time. And this is Shern wearing his 'Magic Glasses' while playing some 'games' with Miss Ho in identifying the numbers in the book. After a thorough check, which lasted about an hour or so, she is done. She sent Shern out to play with Pho-pho keeping an eye on him. Then hubby & I stayed in the room while Miss Ho explained to us in detail the whole process of what she did, and the results. Overall results is good. Shern had a slight long-sightedness, but within the normal kids range. No lazy eye, 3D vision is fine, Long distance vision is good. It is nothing serious so she didn't prescribe any spectacles for him. Phew. Miss Ho also commented that Shern is very expressive for his age. The fact that he could tell me he squinted initially so that he could see more clearly, was very unexpected from such an age. And he also mentioned pictures were "blur-blur" And also during the eye check, when Miss Ho pointed to the shapes that were getting smaller and smaller and asked if he could still see it, Shern replied "I can see if I go nearer!". Very impressive of his expressions indeed! Lol. On our way home, Shern was tired and fell asleep in Pho-pho's arms. 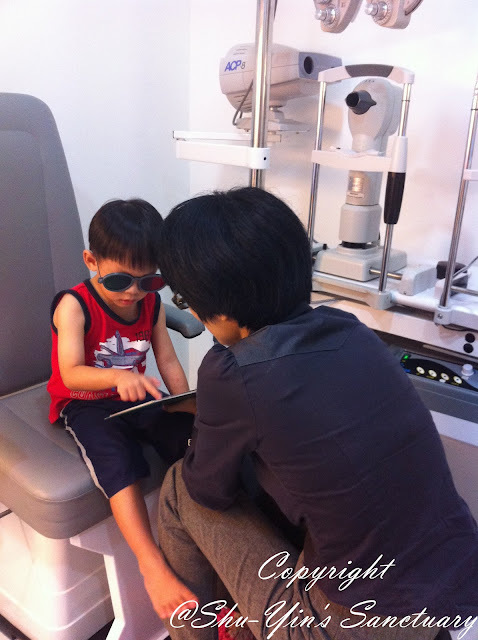 Miss Ho said the next eye check-up would be when Shern is between 5-6 years old. She said most parents ignore bringing their kids for eye checkup, but the fact is it is very important because kids learn through vision, which I thoroughly agree. Bringing kids for eye checkup is a preventive measure of developing serious eye condition. And guess how much is the bill? RM50. 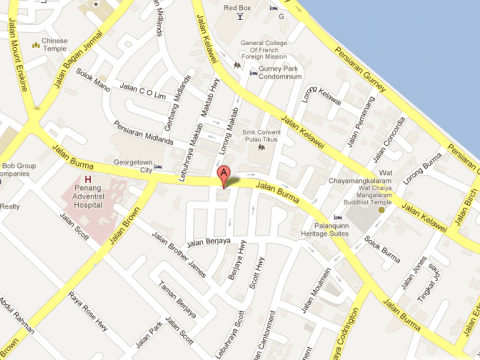 Only RM50 for her professionalism and hour-long consultation. Very worth the money. I think I am going to bring Khye for an eye check too next week! Specialization:Infant / Toddler Vision Assessment, Binocular Vision Assessment, Vision Therapy for Lazy Eye, Squints etc., Visual Motor/Perceptual Skills Assessment, Myopia Control.